Update: You can now watch back the world's first ever Facebook Live murder mystery, but you won't be able to take part anymore. Scroll down below for the video feed. Ever fancied yourself as a real-life Poriot or Columbo? 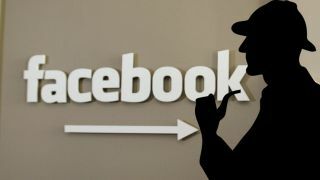 A new Facebook Live event may be the perfect opportunity to try your hand at solving mysteries without having to get up off the sofa. We went along to preview the first ever Facebook Live murder mystery, called Framed. It’s a spin on traditional murder mystery events, where you play a detective and try to solve a fictional crime through a series of clues to find out who killed the victim. But this time, it’ll take crowd-sourced teamwork to crack the case. And we didn’t do particularly well. In the 10-minute preview – which was the opening scene for tonight’s experience – we got caught by the police after only taking a few steps toward solving the murder. The story begins with a security guard locked in an art exhibit with a dead body, the murder weapon and a series of clues to kick things off. Soon the police are on their way – but they will take about an hour to get to the scene, and the main character will fail if the crime isn’t solved before they arrive. The audience will have to work out exactly how to solve the murder in the allotted time, and that’s where Facebook Live and you come in. You’ll be able to vote and leave comments on the Facebook Live stream to tell the main character what he should do to solve the case. As it’s the internet, the team behind the project are aware there will likely be some offensive remarks in the comments feed. The team assured us a moderator will be on hand to bring some of the best comments to appear on the screen and be used as instructions, but most of it will be done through voting. Two options will appear on the screen. For example, “root through the bin” or “don’t look in the bin” – the audience will then press the reaction button “Haha” for the former or “Wow” for the latter. Pearson said, “That’s a way for us to cut through the noise a bit more and steer people down the right directions as well to make sure they don’t go too off-piste. This is the first time an experiment on Facebook Live has been undertaken, but it’s not the first murder mystery UKTV has tried to create over social media. Twurder was a previous project made by the network where audio, visual and written clues were revealed on Twitter. Followers then tried to work out the culprit, but Facebook allows for a live video feed instead. Taking place on Alibi’s Facebook feed – which has 45,000 fans already – the network hopes a buzz will see it grow to far more viewers than just its fans. Although the production is only for social media and won’t be transmitted on TV, the crew is similar to a TV show shoot with audio experts, actors, lighting and many more involved in the project. Alibi may also look to show this content on TV in the future if it proves a success. If this proves to be a success you may one day see similar interactive events taking place on Dave, Gold, Eden or other UKTV channels. But Framed’s success will rely on how many tune in and interact for the full hour. Pearson said: “I’ve got faith in the public to solve it. But ultimately there’s a little bit of volition with the main character. You can take part tonight (October 13) on the Alibi Facebook page at 8PM BST (3PM EST, 12PM EST, 6AM ACT) to try your hand at solving the crime. But there’s a lot that can still go wrong. Bad internet connections, live mistakes from the crew, small viewer numbers and a lack of interaction on the page could still cause issues on the night. Whether the internet comes together to collaborate and make a hive mind version of Columbo is yet to be seen.